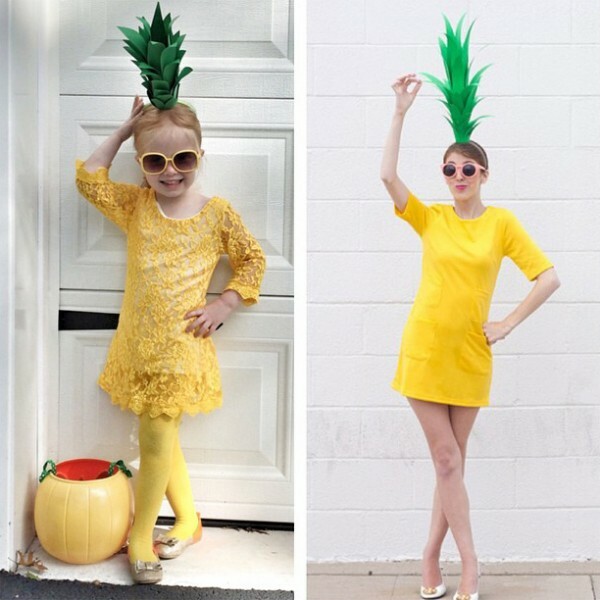 Well then I happened to see if there were any other Pineapple Costumes out there, so I looked on pinterest, and apparently almost everyone has already thought of this idea, oops! 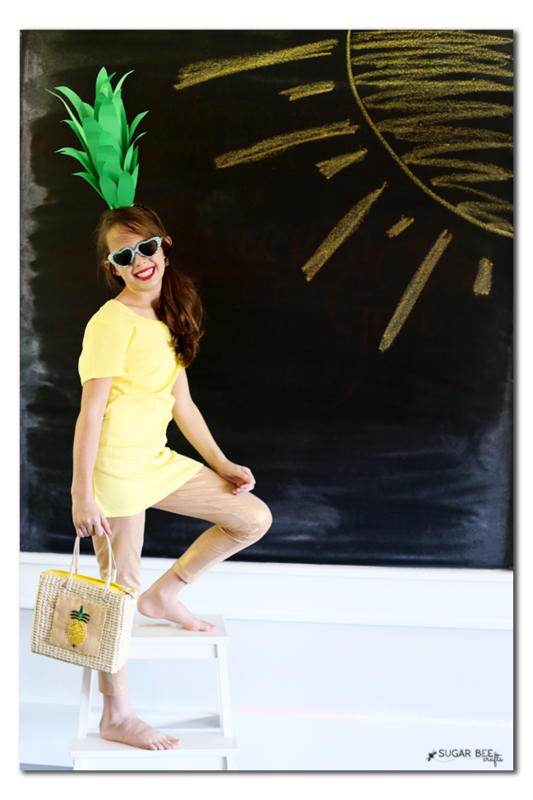 But I have it here for you anyways, just in case it’s new to you (like it was to me) – – there are a ton of cute ones out there, but I was especially drawn to the one by Studio DIY shown below, so we did have to add sunglasses like they did – so cute! 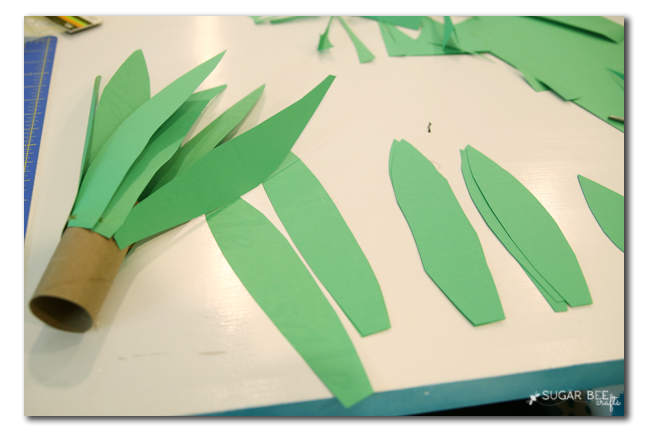 So the only part you need to make is the leaf topper (does that thing have a name??). To do this, cut your cardstock into various lengths. Then you just hot glue them all around. I started with the longest ones, and to make them a little taller I started at the top of the empty tp roll. Just attaching them with hot glue. 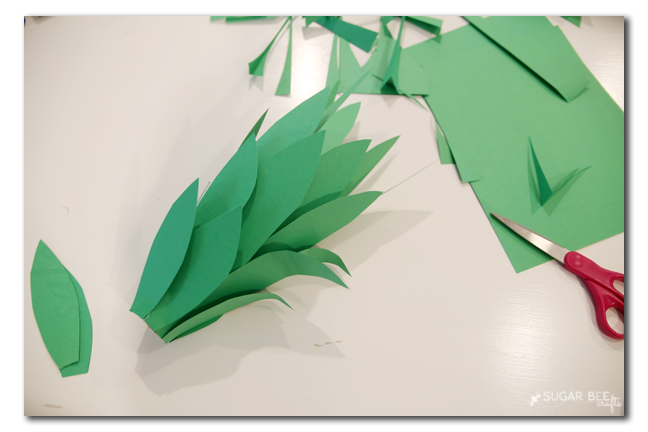 Then I kept working my way down the tube, with shorter and shorter leaves. To attach it to the headband, I used some leftover leaves, cut into a couple of strips. 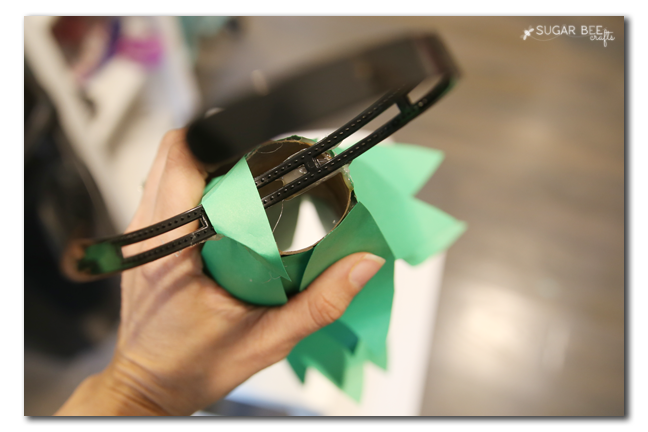 I glued it around the headband and then back up on both sides of the tube – you can kind of see what I mean in the pic below. I show it with one strip one, and then I added another. Then just wear it as a regular headband – super cool!! 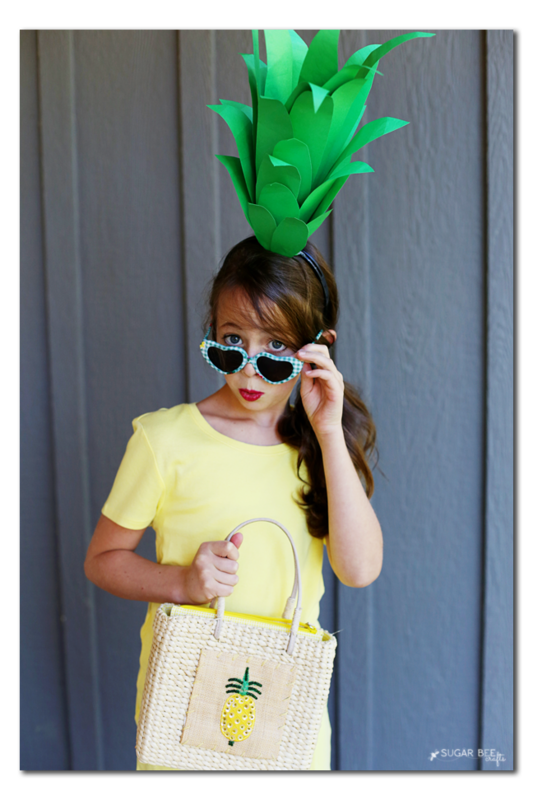 And yes, pair it with that yellow shirt, gold leggings, and grab your pineapple purse (thank you thrift store hunt!) and you are costumified in no time! 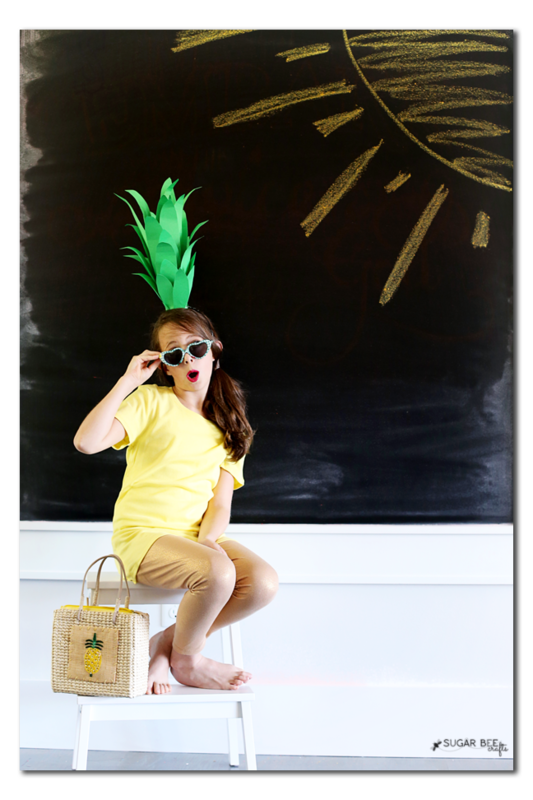 We are sure having fun using the chalkboard as a photo backdrop – LOVE having a giant chalkboard wall! Looking for other costume ideas?? 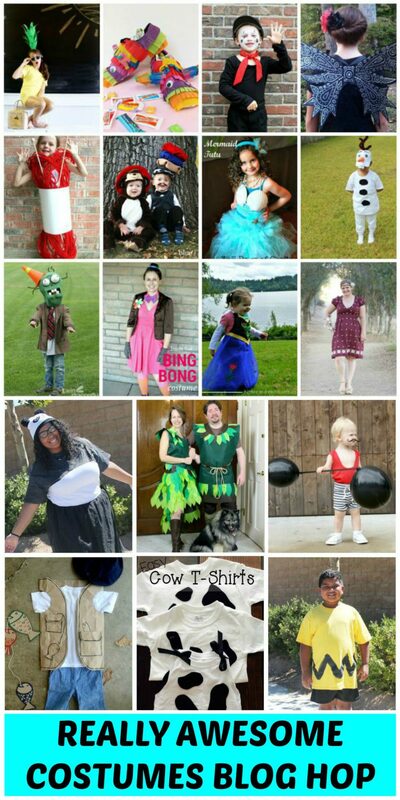 I’m super exciting to be participating in this Really Awesome Costumes Blog Hop with all these really awesome bloggers – be sure to check out all the amazing projects! My DIY Halloween costume tutorials are featured on House of Ideas. 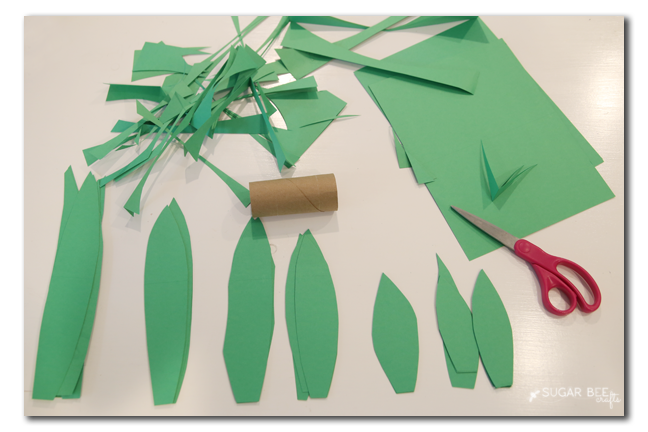 Thank you for your super easy leaf topper tutorial! 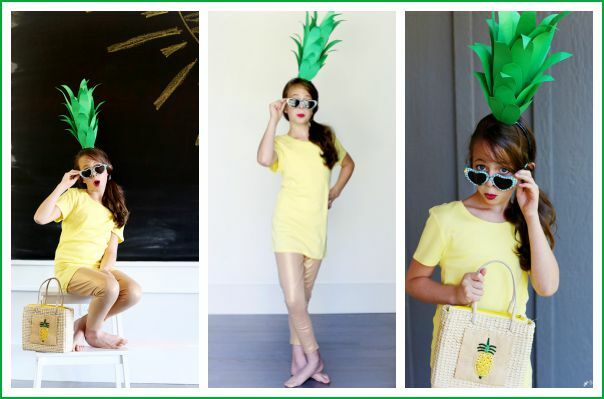 I made one to go a long with my daughters pineapple costume for Halloween! !